The playing on this release is superb, and ultimately it just about won me over, though I'm not as keen on this take on Sitkovetsky's arrangement as many others have been. It's often heard for String Trio, but the Britten Sinfonia play with a full string orchestra: using, respectively, 6, 5, 4, 3, 2 instruments per section. It sometimes works and it sometimes doesn't. Generally, I preferred the more intimate variations though, as the disc wore on, I was slightly more convinced. The Aria is scored for string trio only and, taken at a leisurely pace, is very beautiful, with an emphasis on legato phrasing. Variation 1 is scored for fuller strings and, while it's less intimate and a little jarring after the intimacy of the aria, the chugging of the violas and cellos makes the inner workings of the variation perhaps even more audible than I've heard before. That is, in fact, the principal gain of most of Sitkovetsky's arrangement: hearing Bach's keyboard music arranged for a different context makes new things come out of it, and the effect is often very illuminating to the work's architecture. It's the smaller scored variations that stay with me most, however. The Gigue of Variation 7 is like a courtly duet, entirely appropriate to the dance-based format of the movement. The canon of Variation 9 is beautifully logical, and Variation 11 is very conversational, beginning as a cello duet before involving the violin at a later stage. Variation 8, on the other hand, bustles along nicely on the full orchestra, but sounds too busy to my ears. 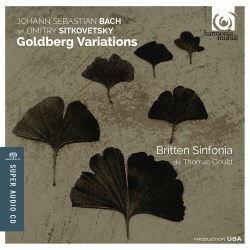 Variation 12, however, uses the full orchestra to very exploratory effect, seeming to push the boundaries of the music, almost into new terrain. Going from this into Variation 13 is a tonic, a cleansing of the ear, almost, as though moving from the public into the most intimate. The strings then add a greater sense of attack to Variation 14, and here for perhaps the first time I could hear the positive benefits that an instrumental arrangement for strings (as opposed to any other instrument) could bring. A similar effect is felt in the Ouverture that comprises Variation 16, which swaggers brilliantly, something which is also true of Variation 29 which comes across as winning where, on the keyboard, it can often sound a bit laboured. Variation 18, the canon alla sesta, sounds eminently cultured and delicately outworked, as does Variation 19, a virtual courtly dance, while Variation 20 sounds chatty to the point of being argumentative. No. 22 adopts a more affable tone, though, and Thomas Gould enjoys showing off his considerable technical skills in the solo line of Variation 23. As for the minor key variations, No. 21, the canon alla settima, combines fuller strings with lesser forces, and to me it sounds too inconsistent. Variation 25, on the other hand, the Black Pearl, works because its arrangement is so spare, the string playing so stripped back as to sound virtually existential in places. Through it all, the playing of the Britten Sinfonia is truly assured, and they pour their energy into making it work as best they can. My doubts remain, and I'm not sure how often I'll return to this, but I'll admit that the Quodlibet sounds fantastic, rich and full, finally justifying the use of the full orchestra, a proper summation to the set.